We don’t know the exact age of Isaac, but the next chapter starts with Sarah’s death at age 127, making Isaac 37. He was probably a young man when Abraham took him on the three day journey north from Beershebato Mt.Moriah(Jerusalem). Abraham is probably 120 or so. My vivid imagination makes me think that Abraham did not tell Sarah what God had told him to do! He obviously did not tell Isaac either. Did Isaac think that his father had lost his mind as he bound him and placed him on the altar? Certainly the knots of an old man could have easily been broken by this young man. We often focus on Abraham’s great act of faith, obeying God’s command to sacrifice his son, the son whom he loved, his only son, as God reminds him; (v. 2) but what about Isaac? He completely submitted his life to the binding, lying out, and the blade of Abraham’s knife! What kind of a man was Abraham that his grown son would submit to this? There are many painting and drawings of Abraham’s sacrifice, but I believe Rembrandt’s captures the emotions the best. We see Isaac, hands bound lying on his back, his neck fully exposed. Abraham would have slit his throat, the way sacrifices were slain – the most merciful. Abraham is covering Isaac’s face with his hand, but before he did, can you imagine the look that passed between father and son? Again, I ask – what kind of a man was Abraham that his grown son would submit to this? He was a man of great faith who would obey his God no matter what the requirement! He had already lost one son, casting out the bond woman and her son, because Sarah had demanded it and God had sanctioned it. Now he is poised to slay his promised heir, the one whom he had waited a lifetime to see. 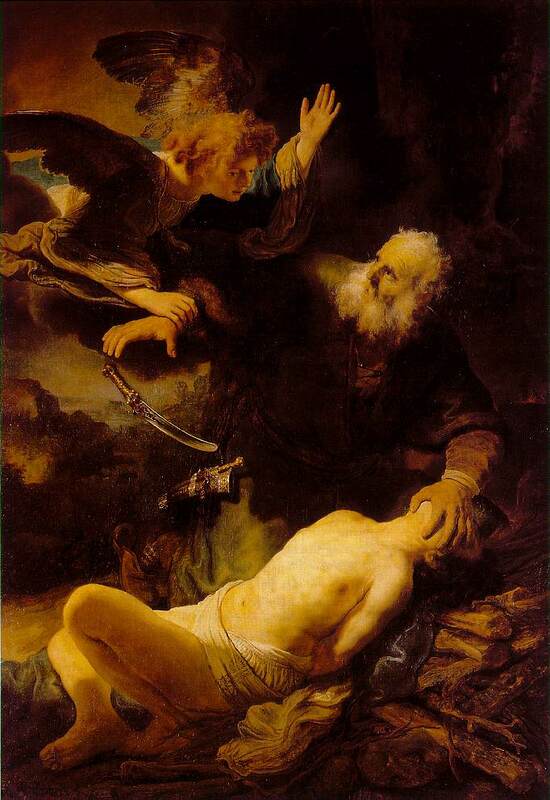 In Rembrandt’s painting, and angel is clutching Abraham’s wrist, the knife has fallen from his grasp as he looks in the angel’s face. Faith – the substance of things hoped for, the evidence of things not seen. Corrie ten Boom, Holocaust survivor said, “We don’t need a great faith, just a little faith in a great Savior.” Know that you can be just as faithful to God as Abraham – trusting God even though there is no evidence of the outcome.